Gold inched up on Tuesday, stretching its gains into a third straight session as buyers in China continued to snap up deals after bullion’s plunge to a three-year low last week. Prices were also helped by short covering that kicked in after gold logged its biggest ever three-month loss in the second quarter ended June on indications of an early wind down to the US Federal Reserve’s stimulus measures. “We can see some stock loading in the market and physical buying in Shanghai,” said a trader in Hong Kong. Spot gold rose 0.5 percent to USD 1,258.51 an ounce by 0318 GMT, while US gold rose about USD 2 to USD 1,257.9. Shanghai futures rose for a second straight day after nine consecutive declines. They were trading at over USD 30 premiums to spot prices. Bullion, typically seen as a hedge against inflation, has taken a beating since Fed Chairman Ben Bernanke said last month the economy was recovering strongly enough for the central bank to begin tapering its USD 85 billion monthly bond purchases in the next few months. Gold plunged 22 percent in the second quarter and is headed for a 25 percent drop this year, its biggest decline since 1981. It fell to USD 1,180.71 last week, its lowest since August 2010. Spot gold is expected to end its current rebound at or below USD 1,273 per ounce, according to Reuters technical analyst Wang Tao. Physical demand has not come to the rescue of gold as it did in April when prices fell the most in 30 years. In Hong Kong, gold bar premiums over London prices remained at the same levels as last week, indicating that demand has not picked up strongly, dealers said. Mixed US economic data on Monday added to uncertainty over the exact timing of the Fed’s tapering. US manufacturing expanded last month, rebounding from an unexpected contraction in May, and construction spending neared a four-year high in May. However, hiring in the manufacturing sector was the weakest in nearly four years. A more important jobs report, the US nonfarm payrolls, is expected to be released on Friday. SPDR Gold Trust, the world’s largest gold exchange-traded fund, said its holdings fell 0.12 percent to 968.30 tonnes on Monday – its lowest since February 2009. “Our economists have cautioned that implementation of the new government’s agenda of no stimulus, deleveraging and structural reform means there is an increasing downside that China could experience a temporary hard landing in the next three years,” the bank noted. LONDON : Copper prices in China may witness new lows in the fourth quarter of this year on rising copper mine supply, recent liquidity tightening and lower base metals consumption, stated London based Barclays in its recent market analysis. In the first quarter of 2013, world copper consumption is estimated to have declined by around 5.3% compared with that in the same period of 2012, according to International Copper Study Group (ICSG). Chinese apparent demand declined by 10% owing to a 46% decline in net imports of refined copper. Excluding China, year-on-year world copper usage declined by around 1.7%. On a regional basis, usage is estimated to have declined by 7.8% in Africa, 1.8% in the Americas, 7.6% in Asia, 0.2% in Europe, and 14.3% in Oceania. World mine production is estimated to have increased by almost 11% in the first three months of 2013 year-on-year basis mainly owing to a recovery in production levels from constrained output in early 2012. Meanwhile, according to ICSG projections for 2013, the global copper market is expected to have a production surplus relative to demand. World production of refined copper is expected to exceed demand for refined copper by about 415,000 t, as demand will lag behind the growth in production. For 2014, although a recovery in usage is anticipated, a higher surplus is expected with increased output from new and existing mines. Freeport McMoRan has restarted open pit production at its Grasberg mine in Indonesia, and the company expects underground mining to resume shortly. Furthermore, the labour contract negotiations have yet to be restarted, a process that poses a further risk of disruptions, according to Barclays view. Traders can play well in copper trading with copper updates which help traders to get better idea to trade in copper. Get accurate free intraday trading tips by sharetipsexpert.com to make huge profit in commodities. For intra-day, support for the commodity is seen at 5600 while resistance is seen at 5630. If prices break the level of 5600 then prices are expected to move towards 5580. MCX crude oil futures for July delivery was seen trading down by 0.04% at Rs. 5612 per barrel as of 11.56 PM IST on Saturday. MUMBAI: The trend in crude oil futures for July delivery on India’s Multi Commodity Exchange (MCX) looks bearish for the day and traders are advised stay at sell side. “For intra-day, support for the commodity is seen at 5600 while resistance is seen at 5630. If prices break the level of 5600 then prices are expected to move towards 5580,” said Amrita Mashar, Research Analyst at Commodity Online. “Traders may take buy position near 5610 with the stop loss of 5630 for the target near 5580,” she added. MCX crude oil futures for July delivery was seen trading down by 0.04% at Rs. 5612 per barrel as of 11.56 PM IST on Saturday. With accurate mcx crude tips traders can make valuable profit in mcx crude trading, Sharetipsexpert offers accurate mcx crude tips for traders which help traders to get good profit in commodity trading. Last week, in the global market, crude oil prices fell to the lowest since September on higher than expected rise in US crude oil inventories, concerns over economic recovery in China and the United States and US Federal Reserve Chairman Ben Bernanke stated that the Central Bank may end its monetary stimulus partially this year and potentially withdrew it by the middle of next year on the assumption that US economy is improving. WTI crude oil futures for August delivery on NYMEX closed down by 1.32% at $ 93.89 per barrel on Friday. Brent crude oil futures for August delivery on NYMEX closed down by 1.19% at $100.94 per barrel on Friday. India mines miniscule 120 kg Gold in April 2013; yet proves Chidambaram wrong! “India does not produce an ounce of gold. You pay in rupee, but the government has to spend dollars to buy gold,” Chidambaram said yesterday. India has produced 120 kilogram of gold in April this month in sharp contrast to its hundreds of tons in imports. This should also be read in the background of Indian Finance Minsiter’s yesterday’s statement on India’s production and consumption of gold. “India does not produce an ounce of gold. You pay in rupee, but the government has to spend dollars to buy gold,” Chidambaram said. “I do not buy gold. To think that gold is the safest investment is wrong,” the finance minister said and was quoted by the Times of India as saying. At least India does produce much more than an ounce of gold! The index of mineral production of mining and quarrying sector in April 2013 was lower by 16.9% compared to that of the preceding month. The mineral sector has shown a negative growth of 3.1% during April 2013 as compared to that of the corresponding month of previous year. The total value of mineral production (excluding atomic & minor minerals) in the country during April 2013 was Rs. 17772 crore. The contribution of coal was the highest at Rs. 5673 crore (32%). Next in the order of importance were: petroleum (crude) Rs. 5671 crore, iron ore Rs. 2712 crore, natural gas (utilized) Rs. 1883 crore, lignite Rs. 490 crore and limestone Rs. 382 crore. These six minerals together contributed about 95% of the total value of mineral production in April 2013. Production level of important minerals in April 2013 were: coal 435 lakh tonnes, lignite 39 lakh tonnes, natural gas (utilized) 2942 million cu. m., petroleum (crude) 31 lakh tonnes, bauxite 2035 thousand tonnes, chromite 242 thousand tonnes, copper conc. 10 thousand tonnes, iron ore 119 lakh tonnes, lead conc. 16 thousand tonnes, manganese ore 194 thousand tonnes, zinc conc. 124 thousand tonnes, apatite & phosphorite 198 thousand tonnes, dolomite 520 thousand tonnes, limestone 242 lakh tonnes, magnesite 16 thousand tonnes and diamond 2928 carat. In April 2013 the output of apatite & phosphorite increased by 33.6%, bauxite 14.7% and iron ore 1.3% percent. However the production of petroleum (crude) decreased by 3.7%, natural gas (utilized) 5.5%, limestone 5.9%, lead conc. 8.9%, gold 11.1%, dolomite 15.0%, manganese ore 18.1%, copper conc. 18.6%, magnesite 20.3%, zinc conc. 23.0%, lignite 27.9%, chromite 30.3%, coal 33.0% and diamond 33.6 percent. 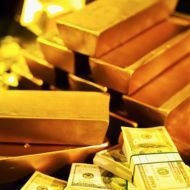 Get accurate gold trading tips to make good profit in gold trading, visit : www.sharetipsexpert.com to get accurate gold trading tips now! “Gold may see consolidation of gains registered on Monday; but weakening of Rupee against Dollar may see the futures scale up further, if the same occurs,” said John Godson, Technical Analyst with Commodity Online. Movements in Indian Rupee are expected to impact MCX gold futures for the day even as analyst suggest that the commodity may consolidate gains of yesterday. Rupee was seen trading at 58.871 against Dollar as of 11.36 AM IST. Gold futures on India’s MCX was seen trading up by 0.85% at Rs.28245 on 11.12 am IST. The commodity as of the time mentioned has maintained the range of 28041-28261. “Gold may see consolidation of gains registered on Monday; but weakening of Rupee against Dollar may see the futures scale up further, if the same occurs,” said John Godson, Technical Analyst with Commodity Online. The weakness in Rupee may let gold on MCX appreciate despite a lack of bullishness in Comex gold, he pointed out. He also provides support and resistance for the yellow metal. Meanwhile, on the Globex platform of Comex, gold for delivery on August 13 was seen trading at $1,383.25/oz, a loss of $2.75 or 0.20% as of 11.30 AM IST. Also, as fiscal risks start to retreat, S&P altered the U.S.’s AA+ credit rating outlook to stable from negative. Besides holdings in SPDR Gold Trust climbed on Monday for the first time since May 29. The US economy meanwhile, added 175000 jobs in May compared to just 149000 in April, reports from last week said. US unemployment rate meanwhile climbed to 7.6% for the month and private non-farm pay rolls expanded just by 178000 compared to the forecast of 180000 in May. Barclays notes that while the job data is signalling that “labour markets are improving at a moderate pace” it is “not decisive” in itself. This means investors would be latched to uncertainty as they try to gleam from the data if or not the US Federal Reserve would phase out QE measures. Barclays also expects the European Central Bank to keep the interest rates unchanged till the end of this year. Since inflation rates in emerging markets have surprised to the downside, Barclays thinks that the monetary policy of these nations may continue to remain accommodative. If the second and third expectations of Barclays are anything to go by, then investors can assume that futures of gold may find some support, though it may not be of on a significant scale if one is allowed to think of the days ahead.